A carpenter ant infestation can be serious business, so it's important to be able to tell when you have one. The ants belong to the genus Camponotus, and because there are 24 subspecies in the United States alone, each with its own characteristics, you can't always identify them by appearance alone. All species have the same destructive nesting habits, though, and they all leave the same tell-tale markers when they establish a colony. The places in which you find them also give away their identity. Carpenter ants aren't always large, and they aren't always black. Some carpenter ants are large. In fact, the jet-black Western black carpenter ant (C. mordoc) can reach a length of 1/2 inch, making it one of the largest ants in North America. A similar species, C. vicinus, can get just as large, but it is not uniformly black -- it often has a reddish tinge. Another common species, C. clarithorax, is yellow and black and doesn't grow much larger than about 1/8 inch. Carpenter ants have elbowed antennae. Termites have straight ones. Carpenter ants have a pinched waist. Termites have a broad one. Carpenter ants have two pairs of wings, and the front pair is longer than the back one. Termites also have two pairs of wings, but they are the same size. Unlike termites, carpenter ants don't eat wood. Instead, they hollow out areas -- called galleys -- where they build their nests. They actually eat many of the same things that other ants do, such as syrupy and sweet substances, so if you see a trail in the kitchen, it doesn't necessarily mean the nest is in the house -- it could be outside. Carpenter ant galleries in structural lumber. If the nest is indoors, it's usually in a place hidden from view, but you'll likely notice small piles of sawdust-like wood tailings, called frass on the floor nearby. 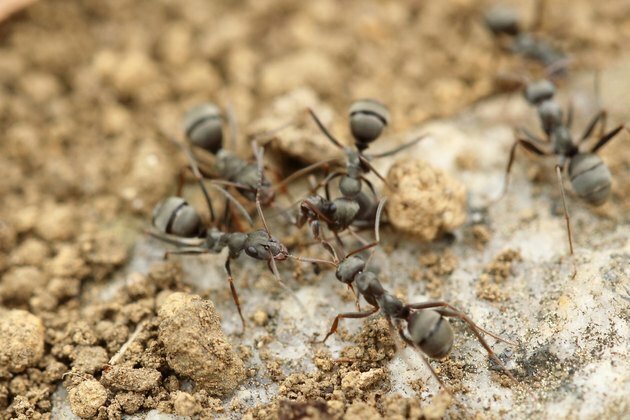 Because the ants prefer damp places, you're more likely to notice frass around areas of condensation or near a plumbing leak -- in short, the same places where you find mold. Carpenter ants like to build their nests in damp wood in dark, poorly ventilated areas inside and outside the house, but they will also nest in dry wood if the surroundings are cool and dark. If you see a trail of carpenter ants in the kitchen, you can often follow the trail back to the nest, which might be in a wood pile outside or in the house framing. The presence of frass is a strong indication of a nest in the house, but if you aren't sure, tap on the wall near the suspected location. The tapping disturbs the ants, and you should be able to hear the sound of their scurrying, although you may have to put your ear to the wall to do it. By creating galleys, carpenter ants undermine the strength of the wood, and damage can be extensive. Unlike some insects, carpenter ants don't abandon their nests on a seasonal basis, and will happily stay where they are for years. They keep adding galleys and sub-galleys as the colony grows and matures. Eventually, the damage may cause structural problems, such as sagging floors or roof leaks. 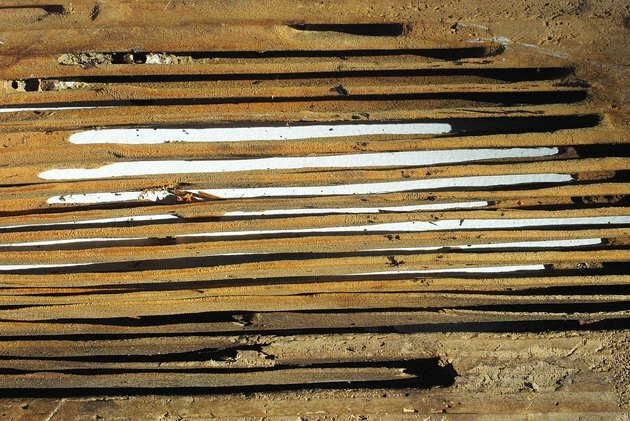 Wood that has been infested by carpenter ants -- whether it's outdoor firewood or flooring joists in the basement -- is usually pocketed with smoothed-out holes and pores. The damage is unlike that caused by termites, which usually leave wood frayed and splintered. Homeowners can draw on a variety of control options -- including sprays, baits and dusting powders -- to get rid of an existing colony. It's just as important, if not more so, to keep the ants from nesting in the first place. You can do this by patching holes in the wall and caulking seams to keep them outside. Cut back tree branches so the ants can't use them as bridges to wet places on the roof. Control moisture in the house with fans and dehumidifiers, if necessary, to eliminate the damp areas favored by the ants. By doing this, you'll also get a jump on mold and rot, which can be just as troublesome as ants.